Who Is At Fault in a Kansas City Commercial Truck Accident? In Kansas City and throughout Kansas and Missouri, there are thousands of commercial vehicles and trucks on the road at any given time. 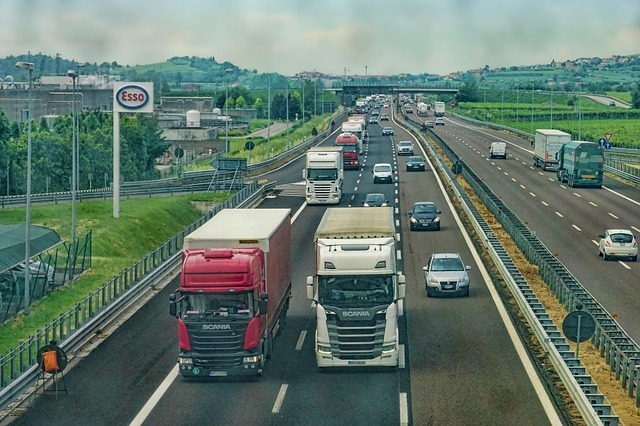 Just think about all the different kinds of commercial vehicles you see every day -- UPS trucks, FedEx vans, semi-trucks/tractor-trailers, eighteen-wheelers, city buses, school buses, pizza delivery cars, taxicabs, Uber and Lyft vehicles. If you consider these along with all the unmarked business vehicles on the road, it becomes clear how prevalent commercial vehicles and trucks are on our roads. Car accidents with commercial vehicles and trucks can occur for a variety of reasons - driver distraction, driver impairment or fatigue, the failure to maintain the vehicle, a vehicle design or manufacturing defect, or driver negligence. Regardless the reason, collisions with commercial vehicles and trucks can cause serious injury and damage. This is primarily due to the heavier weight and larger size of many commercial vehicle and trucks. which insurance policies should pay for your damages. These issues make it difficult to handle these commercial vehicle and truck accident cases without an experienced personal injury attorney. As a result, if you were injured in a crash with a commercial vehicle, you should contact our Kansas City personal injury lawyer as soon as possible to determine who may be at fault and to get the legal process for your recovery started right. When you’re in a car accident with a commercial vehicle, determining who is at fault or liable for the accident can be complicated. A variety of persons or business could have some amount of responsibility in causing the wreck. distributors or retailers of vehicle parts, if those parts contributed to the crash. To determine who is at fault in your specific case, you should contact our Kansas City personal injury attorney. He will investigate the circumstances of the crash and determine who is responsible for paying for the damages and injuries you sustained. After being in a car accident with a commercial vehicle, you will likely be contacted by the driver’s or company’s insurance representative. You should be careful in speaking with the insurance adjuster for a variety of reasons, and we generally recommend that you hold off on speaking with them until after you talk with an attorney. The reason for caution is that the goal of the insurer for the at-fault party is simple: to minimize your claim and ultimately pay you the least amount possible. Anything you say could be twisted against you and used to minimize compensation owed to you. If you did not cause the accident, you should not admit or imply any kind of fault. Avoid signing anything or verbally agreeing to any settlement. Again, consult an attorney first. Keep it short. Don’t offer more details than necessary and just answer the questions that are asked. If you were injured in an accident with a commercial vehicle, whether it was a UPS truck, FedEx van, semi-truck/tractor-trailer, or other vehicle, you should contact our Kansas City personal injury attorney before speaking with any insurance adjuster. Our Kansas City commercial truck accident attorney can help you prepare a statement, gather evidence, determine crash liability, and ensure you get the compensation you deserve. Learn more about crash liability in a car accident with a commercial vehicle or truck in our eBook, Crash Course: 9 Mistakes That Can Wreck Your Injury Claim in Kansas or Missouri. Call the Law Office of Kevin J. McManus at to speak with a personal injury attorney in Kansas City about your legal options if you are in a car accident with a commercial truck or other vehicle.